I love an organized space and I adore some of the spaces I see on Pinterest but I am, like most people, on a tiny budget. That means I can’t spend £11.99 ( it ended up at 21 euros ) on gorgeous fridge storage like this from Amazon even if I wanted too. 1. 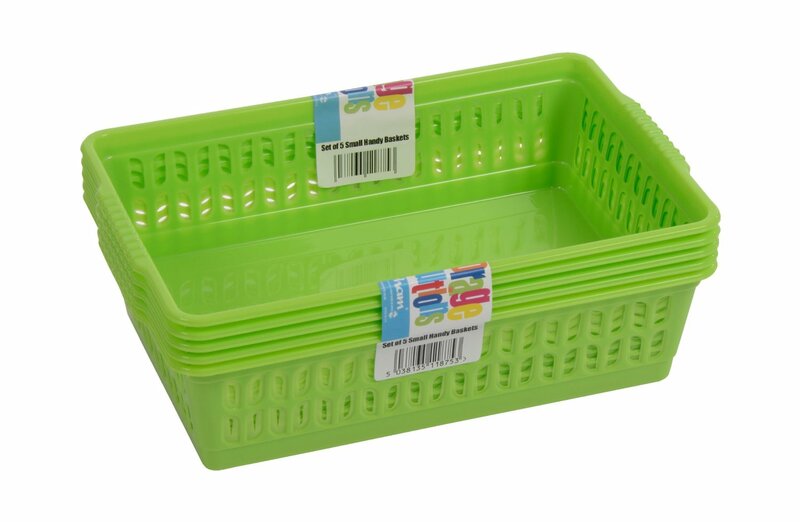 Search your local Euro, Pound, Dollar, Yen store for storage. I found these cute little baskets in my local hardware shop 3 euros for 5 of them and I bought lots of them in green and blue – I have used them all over my Kitchen. They are cleanable in the dishwasher which is a bonus. I found these cute little Storage draws for a couple of euros, as long as you are willing to wait a month or two to get them, they are handy for snacks. 3. 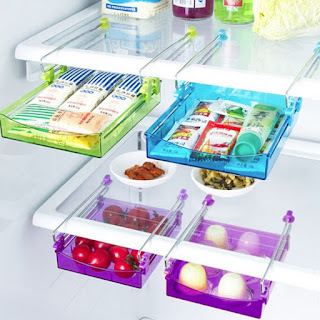 Label Fridge Storage – trust me on this one. I label things because I live with teenagers, they wouldn’t know where something was if you put it in front of them! And would put it back wherever they could if I didn’t have a dedicated space for them. This advice goes for a lot of men and kids – if people can find things they are more willing to make their own snacks and sandwiches too. 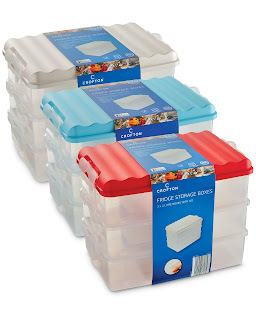 I have this box above that I picked up from Aldi when it was in the shop it wasn’t expensive, it’s BPA free and holds all my sandwich making things – like cheese, cold meats, and spreads. If I am making lunches I just grab out this box and some bread and I have the basis for some easy sandwiches or wraps. 5.Store your leftovers in clear plastic takeout containers. You can usually pick up a pack of 5 for a euro or for a dollar in the dollar store. Place them on the shelf that is eye-line when you open the fridge and then more people are likely to eat them. Once you have filled your inventory in, place it on your Fridge door. That way you always know what is in your freezer section. I have designed a free printable Freezer inventory for you. 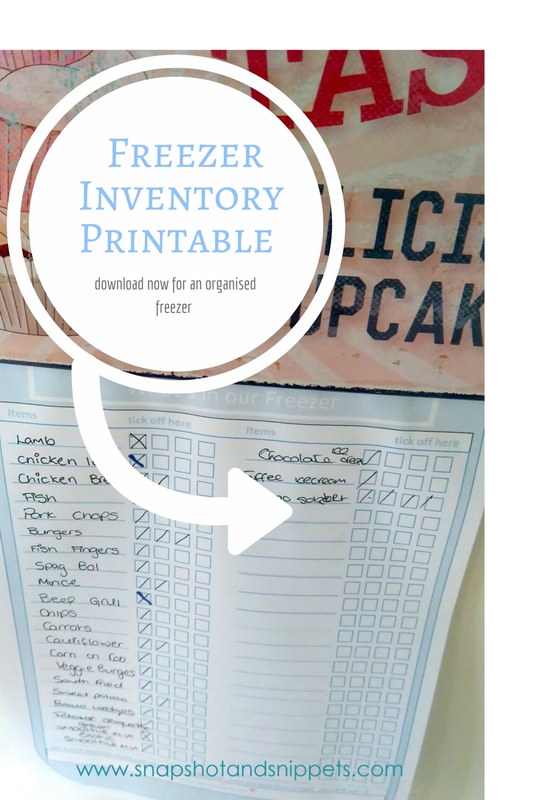 Just print it off and take 10 minutes and log everything in your freezer – it makes meal planning a dream and you always know what you need to pick up in the shop. DOWNLOAD HERE and it is free. I will leave you with a video of my fridge – no giggling at my videoing skills people! I promise to get better at videoing. So Please follow me on on Facebook or Twitter for more videos and post on getting Organised. How being Organised and having a Family Journal can help if the worse happens! 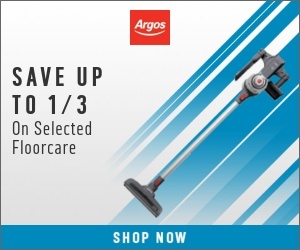 How to clean in 15 when visitors are calling. You can also head over to my Start Here where you find out all about Snapshots and snippets and what I cover on this little blog of mine. Or you can sign up for my Snapshot and Snippets Newsletter where I give my readers exclusive content like to-do lists and recipes and you will get access to my latest Snapshot and Snippets Recipe Ebook. Thank you Krista – mine was definitely not organised before now. I knew things had to change when we a frozen lump at the back of the fridge that used to be a jar of pickles!! These are great tips! My fridge def needs some organizing LOL- it can get chaotic! Tried to download your freezer printable, but it just comes up with a google error- thought you should know. Thanks for sharing this! The freezer inventory sheet is a good idea. Saves buying duplicates.